At one point Dade County was known as “Wade County” and Dwyane Wade was the king of Miami. Then King James decided to take his talents to Miami and Wade stepped aside for Lebron. Add Chris Bosh to the mix and they became known as the “Big 3”. Each player has an essential role on this superteam but people now question whether Wade fulfills his. We live in a “what have you done for me lately” period and it seems people have forgotten he’s a 10-time All-Star, Scoring Champion, 3-time NBA Champion and an NBA Finals MVP. Those accomplishments however have become secondary as over time we’ve seen Wade’s production and time on the court diminish. 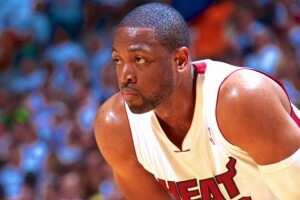 Wade missed 28 games this season whether due to injury or he just needed rest. Whatever the reason, it’s worked out because Wade is averaging 24.3 ppg against the Pacers and pulling out clutch performances when his team needs them. But still people point out his decline and he doesn’t understand why. Wade is averaging 24 points, six assists and five rebounds for his career and is winning championships despite being the on downside of his prime and graciously accepting a sidekick role . So will Wade be appreciated more when he’s gone?